My father and I used to watch Steven Segal movies back when I was in high school.Â Under Siege was the perennial favorite.Â Segal as a SEAL on a train, killing people; it was terrible, but fantastically so.Â Certain lines from Under Siege 2 have even entered our particular vernacular and Fire Down Below is a delight every time.Â They were so bad they were wonderful, with Steven Segal pretending to be a serious actor and his leather jackets and his ponytail.Â Whether an environmentalist, a guy fresh out of a coma, a SEAL or a cop, Segal could be counted on to bring the pain.Â Thatâ€™s why I was so excited to see this DVD. 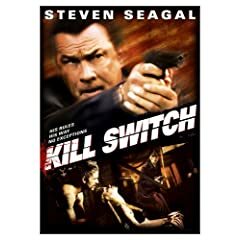 Starting this October 7th, now available on DVD from InSight Film Studios and First Look Studios comes the next chapter in the vast filmography of Steven Seagal.Â Kill Switch is ready to burst into your living room and take you hostage with a tale of killers and street justice.Â Bring home this Seagal movie today! Steven Seagal is ruthless homicide detective Jacob King, someone known for breaking the rules and getting stuff done.Â He and his partner, Storm Anderson, are being investigated by federal agents for being overly rough in an arrest buy propecia online which allowed the perpetrator to walk on his charges.Â Now the streets of Memphis are home to two psychotic killers, an explosive expert and a killer who draws his inspiration from the Zodiac.Â Will King be able to stop them both in time?Â Isaac Hayes also stars as the coroner. The special features included in this DVD are surround sound, English and Spanish subtitles and previews of other films from First Look Studios coming out soon. Compared to this film, Under Siege was an Oscar contender.Â Segal has never been known for good films, but this sinks to a whole new low.Â In one scene, a man is thrown out a window and the expulsion is show eight times in a row.Â The acting is terrible but itâ€™s the editing thatâ€™s the worst of all.Â Ever since The Bourne Identity, fight scenes have been ridiculed because theyâ€™re all fast cuts and no meat.Â The fight scenes in this movie take that to the extreme.Â Half the time, I bet no contact is ever even made.Â This isnâ€™t even good as a bad movie.Â Itâ€™s just terrible. 4 users commented in " Movie Review: Kill Switch "
This is the worst movie I have ever seen! I doubt I will ever watch another Segal movie. You need to give it up steven and go back to Martial Arts demonstrations on the Merv Grifithy show!! This has to be one of the worst movies ever!! !